In November and December of 1887, Tesla filed for seven U.S. patents in the field of polyphase AC motors and power transmission. These comprised a complete system of generators, transformers, transmission lines, motors and lighting. So original were the ideas that they were issued without a successful challenge, and would turn out to be the most valuable patents since the telephone. An adventurous Pittsburgh industrialist named George Westinghouse, inventor of railroad air brakes, heard about Tesla's invention and thought it could be the missing link in long-distance power transmission. He came to Tesla's lab and made an offer, purchasing the patents for $60,000, which included $5,000 in cash and 150 shares of stock in the Westinghouse Corporation. He also agreed to pay royalties of $2.50 per horsepower of electrical capacity sold. With more inventions in mind, Tesla quickly spent half of his newfound wealth on a new laboratory. With the breakthrough provided by Tesla's patents, a full-scale industrial war erupted. At stake, in effect, was the future of industrial development in the United States, and whether Westinghouse's alternating current or Edison's direct current would be the chosen technology. I remember Tom [Edison] telling them that direct current was like a river flowing peacefully to the sea, while alternating current was like a torrent rushing violently over a precipice. Imagine that! Why they even had a professor named Harold Brown who went around talking to audiences... and electrocuting dogs and old horses right on stage, to show how dangerous alternating current was. Meanwhile, a murderer was about to be executed in the first electric chair at New York's Auburn State Prison. Professor Brown had succeeded in illegally purchasing a used Westinghouse generator in order to demonstrate once and for all the extreme danger of alternating current. The guinea pig was William Kemmler, a convicted ax-murderer, who died horribly on August 6, 1890, in "an awful spectacle, far worse than hanging." The technique was later dubbed "Westinghousing." In spite of the bad press, good things were happening for Westinghouse and Tesla. The Westinghouse Corporation won the bid for illuminating The Chicago World's Fair, the first all-electric fair in history. The fair was also called the Columbian Exposition  in celebration of the 400th Anniversary of Columbus discovering America. Up against the newly formed General Electric Company (the company that had taken over the Edison Company), Westinghouse undercut GE's million-dollar bid by half. Much of GE's proposed expenses were tied to the amount copper wire necessary to utilize DC power. Westinghouse's winning bid proposed a more efficient, cost-effective AC system. The Columbian Exposition opened on May 1, 1893. That evening, President Grover Cleveland pushed a button and a hundred thousand incandescent lamps illuminated the fairground's neoclassical buildings. This "City of Light" was the work of Tesla, Westinghouse and twelve new thousand-horsepower AC generation units located in the Hall of Machinery. In the Great Hall of Electricity, the Tesla polyphase system of alternating current power generation and transmission was proudly displayed. For the twenty-seven million people who attended the fair, it was dramatically clear that the power of the future was AC. From that point forward more than 80 percent of all the electrical devices ordered in the United States were for alternating current. 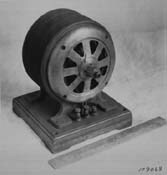 View AC motor patents 381,968, 390,414, 417,794, and 555,190. Explore the components of Tesla's AC motor.